Katarzyna Maniszewska is a 2002 graduate of the University of Warsaw (MA in Journalism and MA German Philology). She received her Ph.D. degree from the University of Warsaw in 2005. Her research focuses on the history and development of political extremism and terrorism with particular emphasis on media coverage of terrorism. She completed postgraduate studies in Issues Relating to Organized Crime and Counterterrorism through the Faculty of Law as well as Postgraduates Studies in Management (Faculty of Management) at the University of Warsaw. She is a member of the Scientific Board of the Terrorism Research Centre and lecturer at Collegium Civitas. Dr. Maniszewska authored two books: “Terroryzm a media” (Wrocław, 2006; “Terrorism and the media”) and “Pionierzy terroryzmu europejskiego: Frakcja Czerwonej Armii” (Kraków, 2014; “Forerunners of the European terrorism: Red Army Faction”). Her academic publications include numerous papers and book chapters devoted – among other issues – to the role of the media (incl. Internet and social media) in the strategies of terrorist organizations. In her papers she points out the significance of media-literacy and public education in enhancing the traditional counterterrorism measures. 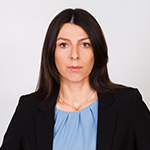 Katarzyna Maniszewska has been working as an advisor and program manager at Polish and foreign NGOs, incl. the position of Program Director at the Polish-American Freedom Foundation. Dr. Maniszewska has an in-depth knowledge of the European Institutions gained during her work at the European Parliament in Brussels (2006-2009). She speaks Polish, English, German, French, Portuguese, and is currently learning Russian and Spanish. She dedicates her free time to backpacking and travel writing.